Queen Elizabeth II is the monarch of Antigua and Barbuda, The Bahamas, Barbados, Belize, Grenada, Jamaica, St. Kitts and Nevis, St. Lucia, and St. Vincent and the Grenadines. She is represented in each country by a Governor-General. 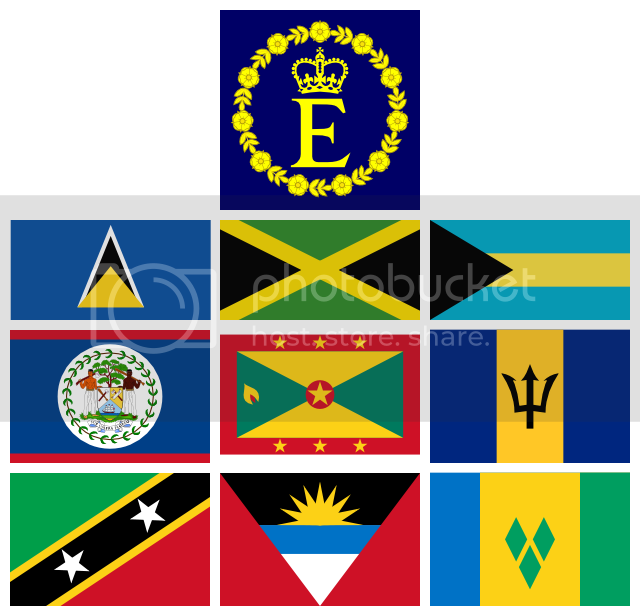 All nine countries are members of the Caribbean Community (CARICOM). Five of the countries (as well as two British territories and even one Republic!) use the East Caribbean dollar as their currency, with the Queen appearing on all banknotes and coins of the currency. Voters in the Caribbean nation of St. Vincent and the Grenadines decide Wednesday whether to break their ties with Britain's monarchy, even as Queen Elizabeth II is making a rare visit to the region. If St. Vincent & the Grenadines votes to become a republic ( ) has it been determined when it will take effect? According to the proposal, a proclamation would be issued that would set the date. The Governor-General shall, by Proclamation issued by him, and published in the Official Gazette, appoint a day for the commencement of the Constitution, acting in accordance with the advice of the Prime Minister; and that day may be referred to as “the appointed day”. A series of ’feelings of the ground’, as they say here, would have told Vincentians yesterday that only by a miracle was the governing party going to get the required majority it sought in order to effect constitutional change. When the polls closed at 5 p.m., it looked like the one third of the voters needed to block those proposed changes may have been secured. The opposition, urging voters to say ’No’ to constitutional reform, may have triumphed. I'm surprised that those pushing for a republic proposed having the president be a Parliamentary appointment... considering how well that went over in Australia. Up to press time the “yes” vote had 44.69% and the “No” vote 56.31% and given the constituencies already in, therefore it is not possible for the “yes” vote to catch or even come close to the required 67%. The official results are available here. They appear to be complete: 43.13% for the new constitution and 55.64% against. Thank you for the infromation wbenson. I'm glad they voted No. I think it sad that they voted to keep a foreigner as their Head of State. I can't wait for the next vote in Australia to break these ties once and for all and truly have an Australian as our Head of State. The Queen is fine for Britain but all other countries should have their own Head of State who truly understands their country and their people by living among them full time, being one of them (and personally I believe they should also have had to be educated in that country at least for the majority of their school years as well). Please speak for yourself. Or at least speak on behalf of citizens of your own realm at the VERY most. LOL! I'm not sure that the monarchy was the main issue. The main opposition party, for example, was against the new constitution but is pro-republic. I did speak on my own behalf. I said "I think it sad..." to start the first sentence. I also said "I can't wait..." to start my second sentence and the second paragraph. As I never changed from that position by saying something like 'the majority of Australians' or 'other people' etc I was always stating my opinion. Later in that same paragraph I even emphasised the point by saying 'in my opinion'. I shouldn't need to use 'I' at the start of every sentence in order to make it clear that the paragraph starting with "I..." is still my opinion. I will in future so that you can see when I am stating my personal point of view. I hope that this will make it clearer when I am speaking personally. I have often wondered why you bother reading or regularly posting on TRF when you so don't want HM as your head of state. Surely your anti-monarchy views are ingruent with following royals. I have travelled to Britain to see the Queen there and I have seen, and spoken to her here but I believe that every country should have one of their own as the Head of State and she is a foreigner here. I do think that Britain would seem strange without a monarch but Australia needs to forge ahead within the Asian region and a foreign, European monarch as Head of State just won't cut it - particularly as so many Asians had such negative experiences of being under British colonial rule. How does my not wanting the Queen to be my Head of State mean that I can't follow the royals? I believe that there are many people here from republics who follow the royals but somehow because I come from a country that will get rid of the monarchy at some time in the future it is incongruent with being a follower of the royals. Let me just state at the outset that I respect your views, and you are surely entitled to them. When you suggest that your views as to HoS changed "mainly due to the actions of William and Harry", what actions were you referring to? I have actually been thinking since making the first post and it really started with their mother who just wasn't 'royal' in my opinion and she raised those two to also see themselves as 'normal' and therefore not special or royal. I see them as being just spoilt rich kids because after Diana's death no one was game to change the way they were being raised due to public outcry and so they have no real presence about them (and yes I have seen both of them and they had no sparkle). I believe that Charles has a presence about him that makes you aware that he is different somehow and the same goes for his parents but his sons are just 'blah' and that means nothing special so why should someone like that be my Head of State. I also find the gushiness of people about these two, along with the constant analysis of what royal women wear as rather demeaning and if that is all they mean to their supporters than they aren't nothing more than movie stars or other celebrities. I suppose it comes down to having seen nothing in William and Harry to inspire me which is unfortunate as I have always admire both the Queen and Prince Charles. You are absolutely right, W & H have certainly been been brought up to be as “normal” as possible. This cuts it two ways: you might argue this gives them a link with common people, and an understanding that his father and grand parents have just never had. The other view is that as a result they do not appear “special”. I certainly accept that there is relatively little mystique about these two at the moment, but they are only in their mid-20s. They need time to develop their interests, and to truly identify the things that are important to them. At this stage of his life, Charles too was floundering and it was not clear how his “professional” life would turn out. In truth, it took the death of Diana for Charles’ work to start to be truly recognised. Lets not forget that William himself is not the heir just yet, and therefore, could reasonably have 20-25 years before he gets the top job. I remember Charles in the 1970s and he had an aura about him even as a schoolboy because he knew he was different. I don't see that William and Harry have ever had that aura and it isn't something that develops. I don't think it can be something that develops but rather something in the way the person is raised. I think that as William and Harry were raised to be normal and therefore not raised with the necessary presence or aura that being royal should entail. I think that the main issue was that the Opposition did not feel that the new constitution with a President as Head of State made the government more accountable and democratic. We are WAY off topic discussing the pro's and cons of Monarchy, aura --- who has it and who doesn't. Let's try to remain focused on the Queen and the Caribbean.